Interstate 97 was the product of the Baltimore-Annapolis Transportation Study (BATS) which started in 1978. Several corridors were studied. The first concept would have been to extend the MD-10 Arundel Freeway southward to Annapolis. The westerly corridor was chosen because it better served not just the local traffic, but the interregional traffic as well. Also, it provided Interstate funding for the first section of the MD-32 Patuxent Freeway. A link from Millersville to Bowie, I-297, would have connected I-97 to US-50/US-301. I-297 was cancelled and the money was transferred elsewhere. I-97 was not one of the original 1956 or 1968 Interstates. The money came from Interstate transfer funds, probably from cancelled portions of I-95 or I-270 near D.C. 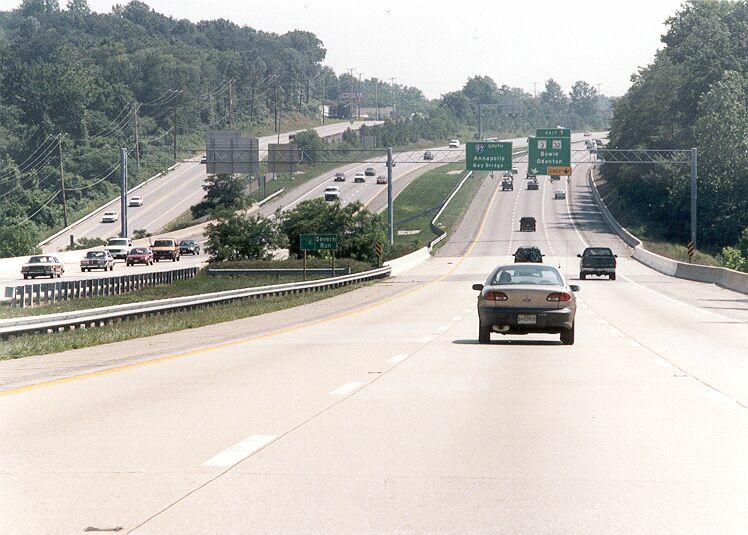 In late-1997, the widening of the Glen Burnie Bypass was completed, and the total cost of I-97 was about $450 million. The lane widths are four lanes from US-50/US-301 near Annapolis to MD-3 at Millersville, then six lanes from there to I-695. I-97 is 17 miles long. Above, I-97 southbound approaching Severn Run bridge, and the MD-3/MD-32 interchange is about one mile ahead. Photo taken by Scott Kozel on July 5, 1999.  There has been discussion of I-97 on the Usenet newsgroup "misc.transport.road" (that newsgroup is the chief place for highway professionals and other interested persons to discuss highway matters on the Internet). I-97 as a two-digit Interstate would normally be a mainline long-distance route, according to the rules for numbering Interstate highways. However, I-97 does not connect to another two-digit Interstate, as the northern terminus is the I-695 Baltimore Beltway. Some posters suggested that a three-digit number might be more appropriate, such as I-995. The I-97 designation stops at I-695, but a freeway continues northward, the Harbor Tunnel Thruway Spur (I-895 Spur), which was opened with the rest of the Harbor Tunnel Thruway in 1957. If the Washington Eastern Bypass is built, it could carry the I-97 designation all the way down to I-95 at Dumfries, Va. The I-97 designation could also be extended northward, up the I-895 Spur, up I-895, to I-95 in East Baltimore. That would be a logical I-97, from I-95 in East Baltimore, to I-95 at Dumfries, Va., an outer bypass of D.C.